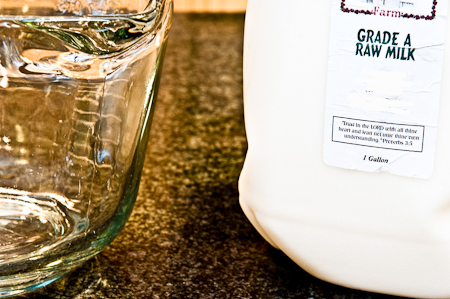 Learn How to Make Greek Yogurt Using Raw Milk. Follow along with this picture tutorial.The instructions are for making regular yogurt and Greek yogurt. Disregard the final step of straining for regular yogurt. I feel like I’m entering rather treacherous territory, but I’ve had several inquiries about making Greek yogurt with raw milk (unpasteurized milk) on my Homemade Greek Yogurt post, so I decided to try it just so I can say I did. I don’t have a cow in the backyard or the back forty. Raw milk is not available commercially in my town, but my son and daughter-in-law are in love with it, so they encouraged me to try it. By the way, thanks to Amanda for helping me photograph this post. Please note: As a home economist, I’m not advocating adding raw milk to your diet. It’s a controversial practice not advised by the USDA. I encourage you to do your own research. Back to the process. I have read that some people don’t heat their raw milk to 175 degrees in the beginning either because they want to save time or because they don’t want to kill certain bacteria. After doing side by side experiments, I have concluded that whether raw or pasteurized, milk which has not been heated to 175 degrees results in a rather thin yogurt. (Please see this recent interview with my daughter-in-law for her experience making yogurt without first heating the milk.) High heat helps to unravel the proteins which seems to aid the yogurt-making bacteria. Since I don’t like to drink my yogurt, and I’m not comfortable letting unheated raw milk sit at 100 degrees for 12 hours, I stick with the method that calls for high heat, then a cool-down before adding yogurt starter. 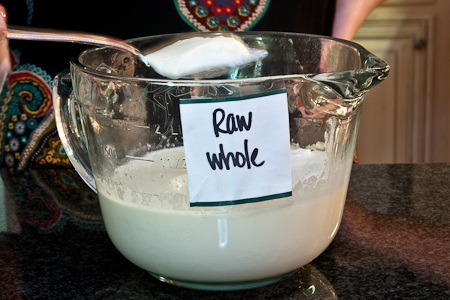 As it turns out, making Greek yogurt with raw milk is exactly the same process as pasteurized milk. What follows is a condensed tutorial. 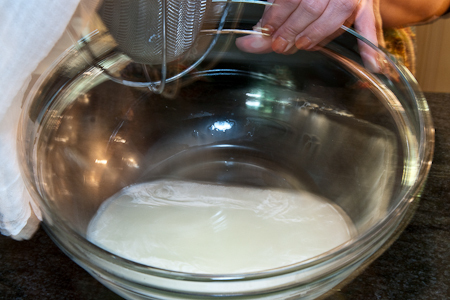 If you still have questions, check out my original post on making yogurt for more details. Use a clean, microwave-safe bowl like this 2-qt Pyrex dish. Heat in microwave until temperature reaches 175 degrees F.
Allow milk to cool on the counter or speed the process by setting in ice. Cool milk down to below 120 degrees and above 100 degrees. 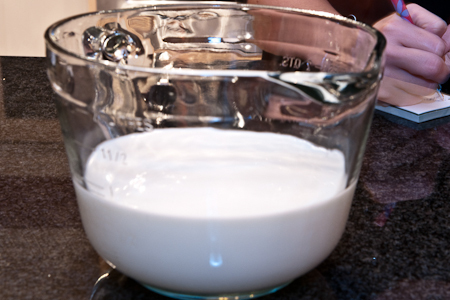 Add 1 teaspoon starter (unflavored commercial yogurt with live cultures such as Fage or yogurt, no more than one week old, from previously made homemade yogurt) per quart of milk. Once you prepare your yogurt by heating it, cooling it and adding starter, find a place in your house to incubate your yogurt. See this post for more ideas. Now go away! DO NOT DISTURB!!!!!! If you peek, you will let some of the heat escape. If you move or stir, you will most likely end the incubation process and no more thickening will occur. After 10-12 hours, go to the next step. If you are not available at that time, it is OK to let it incubate up to 24 hours based on my own experience. In general, the longer you incubate, the tangier the yogurt. See the pictures below for an example of what your yogurt should look like when it has finished incubating. We made three batches using different milk in each. The pasteurized skim milk was the thickest followed by the raw skim milk. The thinnest yogurt was the raw whole milk. Pasteurized nonfat milk was the thickest. Raw skim milk was thinner. The raw whole milk was the softest. You could eat your yogurt at this point– once it has been chilled, but if you prefer Greek yogurt like I do, proceed. 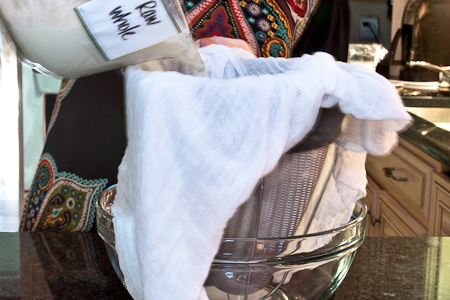 We needed cheesecloth or an old t-shirt to strain the raw milk yogurt. Chilling the yogurt might have allowed us to use the strainer only, like I do with pasteurized milk. 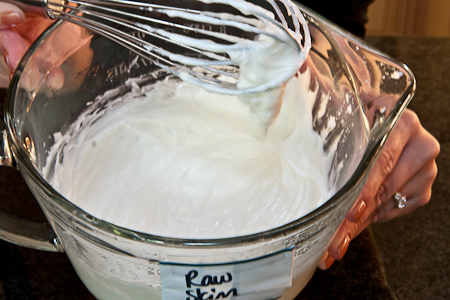 After you have drained the whey, whip it vigorously with a whisk for a smooth silky texture. See how smooth and shiny our yogurt turned out. It will be even thicker when chilled. If you chill the yogurt before straining, it’s possible you won’t need to use a cloth to line your strainer if your strainer is fine enough. 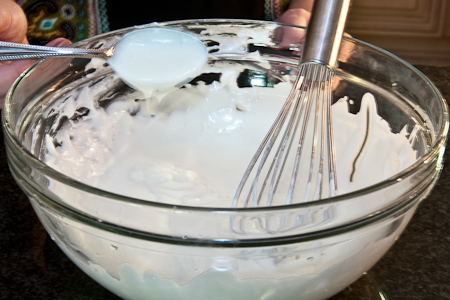 After 1-3 hours (your choice, depending on the yogurt itself and how thick you like it), set the drained whey aside for other purposes and whip the remaining yogurt with a whisk. 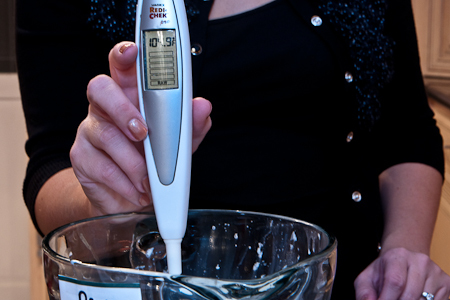 Use some muscle behind that whisk, and you will be rewarded with creamy yogurt. Add flavorings before or after chilling. Enjoy! If you run into difficulty, leave your question in the comment section. Other posts you might find interesting pertaining to making your own yogurt…. I’d love to make some yogurt using a mixture of any and all raw milk I can find (goat, cow, sheep, camel, etc), but I wonder if the bugs would play nice together? For example would one type of colony crowd out the rest when heated to make the yogurt? Also, Mad Cow disease is so scary, is there any way to lower the number of potentially bad germs? You say that you are”not comfortable letting unheated raw milk sit at 100 degrees for 12 hours” but with raw milk to does not go bad. It just gets more and more sour. 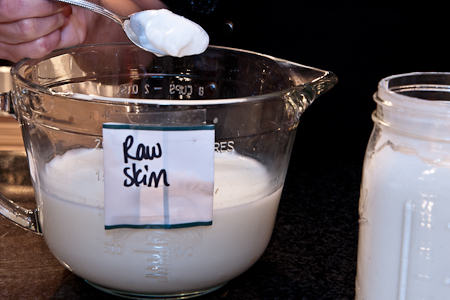 Raw milk is a living thing. I know someone who left raw milk out for several weeks to see what would happen. It never went bad. Thanks for the info! A lot of people say that it is a complete waste to use raw milk if you will be pasteurizing it, but here in California the raw milk we can get comes from 100% grass fed cows, which to me is better milk than the stuff from grain fed cows. I think that the fat in the grass fed milk is of better quality.. Opinions? My naturopathic doctor has cautioned me to not use the microwave for any food (now I use it to kill bacteria in a sponge). She says it changes the molecular structure of food and kills any nutritional value to it. Basically the food becomes a stomach filler but has no value to it. If you have not heard this before, research it online. Most of the Real Food websites do not recommend them. I started reheating food on the stove or in the oven, and it really does have more flavor to it. wow. thanks for the how-to! i’m a bit confused though – this seems so simple, so why are there ‘yogurt makers’? i was going to buy one on amazon, but it looks like it really isn’t needed-? Very helpful-although I’m with Daniel if you are spending money to get milk raw-heating it over 112 doesn’t make sense. Also-using the microwave really changes the chemical structure of the foods heated. From what I’ve researched it really makes the food unrecognizeable to the body. Welcome. If you have read much of my blog, you probably already realize we don’t agree on the whole microwave issue. My research shows much different results than you found. But that’s OK. It depends on who you believe. Hopefully, we can agree to disagree on this point. Regarding the whole heating of the milk thing, it has nothing to do with the taste and everything to do with food chemistry. 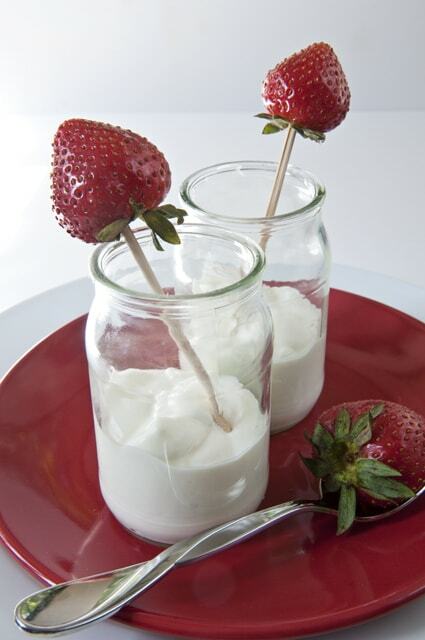 Heating changes the structure of the proteins and makes a thicker yogurt. I prefer very thick yogurt which is why I will do anything to make it thicker. Honestly, I’m no expert on raw milk. It scares me because of the risks involved with disease–especially for people with compromised immunity systems. 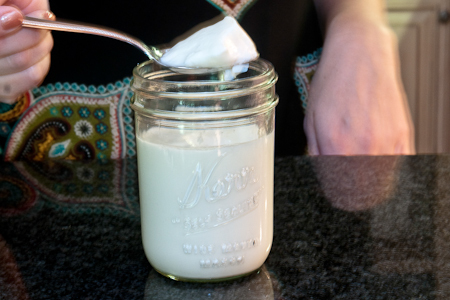 I wrote the post because my kids love it and wanted to make yogurt with it. comprimised immunity systems seems to be an ever increasing percentage of the population. Seems to me that the further away from nature we get the more prevalent it is. Refering to “Raw milk scares me” comment, Marie Curie once said “nothing in life is to be feared only to be understood”. The risks you speak of are unfounded and something that has been said over years and years for generations and people just accept it. Ideas like this need to be rethought and reexamined over time as technology and sanitation methods improve. Hey just so you know pastuerised milk means to be heated to 161 degrees for 20secs. If you pay heaps of money for raw milk only to heat it up then it kinda defeats the purpose of raw milk. im still trying to find a way to thicken it without heating it. If you are looking at the benefit of raw being only the good bacteria and losing that when you heat it, then you are right, don’t waste the raw milk money. Don’t forget all the antibiotics and hormones that is in store milk. If I can avoid those but lose the good bacteria with the heating process, it is still worth it to me. 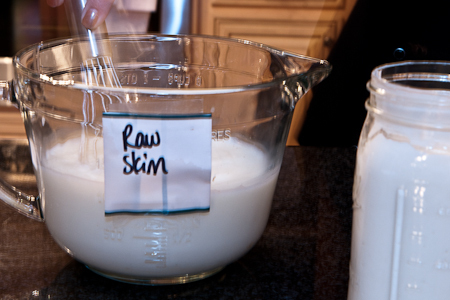 Raw milk is not only about drinking to get what store milk does not have, but also what Raw Milk does not have it in too. So you are assuming now that raw milk doesn’t have antibiotics and hormones. Raw doesn’t mean organic. If you want to know for sure ask the farmer directly assuming the farmer isn’t going to lie. a poor farmer will try to cut costs by using more cows per area of land thus increasing diseases and thus the need for antibiotics or hormones for faster growth. Unless the farmer is poor for not doing this. I would just like to add that all milk you purchase in the store has no antibiotics in it! All milk is tested before it is even unloaded at the processing plant. If any milk has a trace of antibiotics in it they will not use the milk and it is spread on a farm field. ANY milk you buy in a store is free of antibiotics! I am lactose intolerant. I drink lactose free milk but I can eat cheese that is aged and greek yogurt from the store. My question is, can I make yogurt @ home from lactose free milk? Cari, Sorry, I have never tried it but it’s on my list. Probably not. The lactobacillus acidophilus (bacteria in your starter yogurt culture) need the lactose in regular milk to turn it into yogurt. However this will not be a problem for lactose intolerant people (including myself) as the process of making milk into yogurt uses up the lactose in the milk. If you have a little gastric distress after eating your homemade yogurt try just letting it sit another day in the fridge before you eat it…the live yogurt cultures will continue to “eat” any remaining lactose in your homemade yogurt. WOW I have been converted to the greek yougurt craze!! 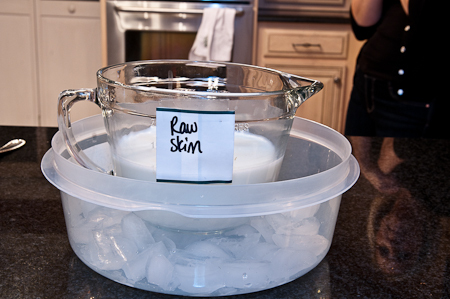 I have been making my own yougurt with the cooler and warm water incubation to great results using raw milk from my family farm. I stumbled across your website when researching how to make it greek. SO SO SO easy, make yougurt, incubate, then strain through cheescloth, that’s it!! I think I can put the very local Chobani out of my house for ever! Yes chobani is literally 3 miles away, they employ hundreds of people locally ( great for the depressed NY state economy), work 3 shifts, and are still having a hard time getting all the product out that the demand calls for. SO I took your advice and put some bananas on the bottom of sevring size of yougurt, added some pomegrante seeds, topped with half a teaspoon of brown sugar and a shake of cinnamon! Heaven! gee let’s see…..saved at least $10 a week, and to make it, cost me literally pennies! Thank you so much for your blog. Same day with the cream off the top of milk can made the condensed cream of mushroom soup, then added the cream to serve as the best cream of mushroom soup I ever had!, again saving more moola, no more campbells for me! Looking into the salad in a jar, hoping to get some gift cards for Christmas so I can purchase the Food Saver. Hi Paula, Thanks for steering me in the right direction…This time I did not continue heating my milk in the microwave for the additional 15 minutes (as I mentioned above in my note) and happy to say my yogurt came out perfect! That really saved me some time. Looking forward to your next yogurt experiment with the non-dairy milks. Wonder if Almond and/or Coconut milk would make good yogurt? Thanks again for all your hard work!!! Betty, I’m guessing the process would be exactly the same. I’ve also heard one can make yogurt with soy milk and oconut milk. Guess that will be my next project. Paula, Wow! Thanks for taking all the time to document all this! Have you though of writing a book? I would buy it! You are amazing! Informative as always. You really are becoming the yogurt making guru, which I think is kind of cool. My chiropractor would be loving the raw milk suggestion since he advocates no milk unless it is raw due to all supposed meds. the cows are on to keep them healthy to produce milk. He is a bit extreme as expected of chiropractors. Great post Paula. Hi Paula! I have learned more great things through your website. Question: I read somewhere that after heating my milk up in the microwave (I was taught to take it up to 180 but I don’t know if it makes that much difference or not) that I should try to hold it at that temperature for another 15 minutes (in the microwave) before starting the cooling process…I assume it has something to do with the speed of stovetop vs microwave and not having enough time to loosen the proteins. Have you ever heard of doing this and do you think it is necessary? In one of my experiments with using “nonfat dry milk” I tried skipping the 180 degrees and went for just below 120 (since it was already homogonized and dried) and then I added my starter …but it did not work… upon final inspection I saw it did not set…it was very runny and was already 10 hours old had to throw it out… so I found heating it up to approx. 180 (ish) a necessary step..I just don’t know if I need to keep it at that temp for 15 minutes.